Translated in the Tang Dynasty by the Tripitaka Master Shramana Shikshananda of Khotan. At one time, the Buddha was in the country of Magadha. 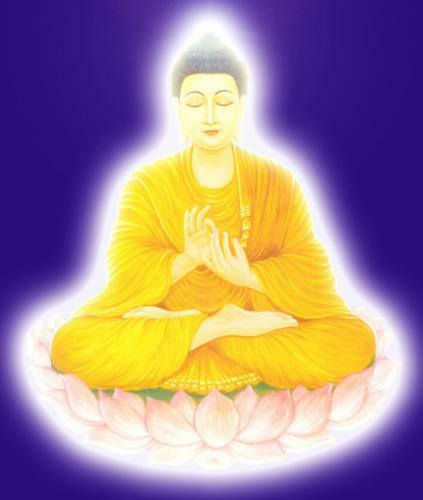 [The Buddha was]...at the bodhi field of aranya-dharma, upon initially realizing Proper Enlightenment. The ground was adamantine, firm, and solid, adorned with sublimely wonderful precious wheels, multitudes of jeweled flowers, and immaculate mani gems. An ocean of various colors and forms appeared in boundless manifestations. Banners made of mani gems constantly poured forth bright light and wondrous sounds. Jeweled nets and exquisitely fragrant flowers were garlanded all about. Regal mani gems wrought transformations with ease, endlessly raining down treasures and multitudes of wondrous flowers, which scattered and fell to the earth. Jeweled trees were lined up neatly, their branches and foliage verdant and luxuriant. It was due to the Buddha’s spiritual power that all such adornments manifested within the bodhimanda. The Bodhi tree was tall, extraordinary, and rare. Its roots were made of vajra, its trunk of beryl, and its branches and twigs of an assortment of wondrous jewels. Its jeweled foliage created a thick arbor, providing shade like a bank of clouds. Multi-colored jeweled blossoms and their branches sprinkled shadows everywhere. Moreover, fruits made of mani gems blazing with dazzling light were interspersed among the blossoms. From all around the Bodhi tree, bright light poured forth. Within that light fell a rain of mani gems and within those mani jewels, Bodhisattvas profuse as clouds simultaneously appeared. Moreover, due to the Thus Come One’s awesome spiritual power, the Bodhi tree issued constant and wondrous sounds, proclaiming Dharmas without end. In the palace of the Thus Come One, towers and pavilions that were vast, magnificent, and adorned pervaded the ten directions. Fashioned of mani gems, they were multi-hued and enhanced by various intertwining and jeweled blossoms. From all adornments therein, light poured forth like clouds, forming banners of overlapping reflections in the galleries of the palace. Innumerable Bodhisattvas and all the assemblies in their bodhimandas gathered there together, issuing the light of all Buddhas and inconceivable sounds. Regal mani gems accentuated lace-like nets. All these states appeared from within the bodhimanda due to the effortless spiritual power of the Thus Come One. Images of the dwelling places and abodes of all beings also appeared therein. Moreover, the aid from the spiritual powers of all the Buddhas encompassed the entire Dharma Realm within a single thought. The lion throne was tall, immense, and exquisite. The dais was made of mani gems; the nets, of lotus flowers. Pure and wondrous jewels formed the wheels, and multi-colored flowers were fashioned into garlands. The halls and pavilions, towers and alcoves, stairs and railings, doors and windows, all objects whatsoever, were completely bedecked. The branches and fruit of the jeweled trees spread out symmetrically. Clouds of mani light shone one upon another. The Buddhas of the ten directions conjured up majestic pearls. All Bodhisattvas came, emitting dazzling light from the wonderful gems in their topknots. Moreover, aided by the awesome spiritual power of all the Buddhas, they proclaimed the Thus Come One’s vast, great state, their wonderful sounds far-reaching and eloquent, penetrating everywhere. At that time, the World Honored One, seated on this throne, had realized Utmost, Proper Enlightenment in regard to all dharmas. His wisdom entered the three periods of time as completely level and equal. His body filled all worlds. His sound reached each and every land of the ten directions, just as space contains all things, yet does not differentiate among them; or as space pervades everywhere, impartially entering all lands. His physical form, eternal and ubiquitous, was seated in all bodhimandas. 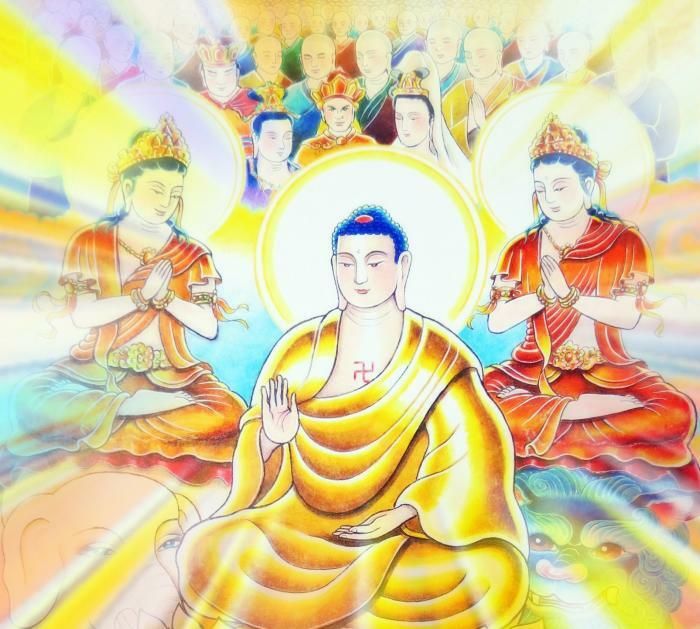 In the midst of the Bodhisattva multitudes, the Buddha emitted awesome, magnificent light, as when the rising sun illuminates the whole world. The great ocean of the multitudes of blessings cultivated in the three periods of time had already been purified, and yet he constantly manifested birth in all Buddhalands. His boundless physical marks were perfect and full. His radiance pervaded the Dharma Realm equally and without discrimination. His proclamation of all Dharmas resembled a great cloud spreading out. His every hair tip accommodated all worlds without obstruction. On each he manifested the power of measureless spiritual penetrations to teach, transform, tame, and subdue all sentient beings. His body filled the ten directions, neither coming nor going. His wisdom penetrated all phenomena and fathomed the emptiness and stillness of all dharmas. Every spiritual transformation of all Buddhas of the three periods of time without exception was visible within that light, and all adornments of the lands of all Buddhas throughout inconceivable eons were completely manifest therein. The Buddha was surrounded by Bodhisattvas Mahasattvas as many as dust motes in ten Buddhaworlds. Their names were: Bodhisattva Mahasattva Universal Worthy; Bodhisattva Mahasattva Supremely Luminous Lantern of Universal Virtue; Bodhisattva Mahasattva Lion Banner of Universal Light; Bodhisattva Mahasattva Splendid Light of Universal Jeweled Flames; Bodhisattva Mahasattva Universal Voice with Meritorious Virtue Like a Banner or Ocean; Bodhisattva Mahasattva Universal Wisdom-Light Illuminating the Thus Come One’s Realm; Bodhisattva Mahasattva Universal Jeweled Cowl and Flower Banner. Bodhisattva Mahasattva Delightful Sounds that Bring Universal Enlightenment; Bodhisattva Mahasattva Universal Purity and Light of Infinite Blessings; Bodhisattva Mahasattva Universal Radiance of Characteristics. Bodhisattva Mahasattva Ocean Moonlight’s Great Radiance; Bodhisattva Mahasattva Immaculate Treasury of Rumbling Clouds and Shining Ocean; Bodhisattva Mahasattva Jeweled Cowl of Meritorious Virtues Born of Wisdom; Bodhisattva Mahasattva Bright Light of Meritorious Virtue and Majestic Freedom. Bodhisattva Mahasattva Lotus Headdress of Proficient Courage; Bodhisattva Mahasattva Universal Wisdom Resembling Banners of Clouds and Sun. Bodhisattva Mahasattva Adamantine Navel of Great Vigor; Bodhisattva Mahasattva Banner of Fragrant Blazing Light; Bodhisattva Mahasattva Resplendent Virtue and Beautiful Sound; and Bodhisattva Mahasattva Light of Great Blessings Born of Wisdom. These were some of the leaders, and they were as many as dust motes in ten Buddhaworlds. All these Bodhisattvas had amassed good roots and cultivated Bodhisattva practices in the past, together with the Thus Come One, Vairochana, and all of them were born from the ocean of the Thus Come One’s good roots. They had completely perfected all paramitas. Their wisdom eye was clear and penetrating, and they contemplated the three periods of time as equal. They had reached total purity in all samadhi. Their ocean-like eloquence was infinite and vast. Replete with the meritorious virtues of a Buddha, they were venerable and dignified. They knew the faculties of sentient beings, taming and transforming them accordingly. They had entered the treasury of the Dharma Realm by means of the wisdom of discrimination. 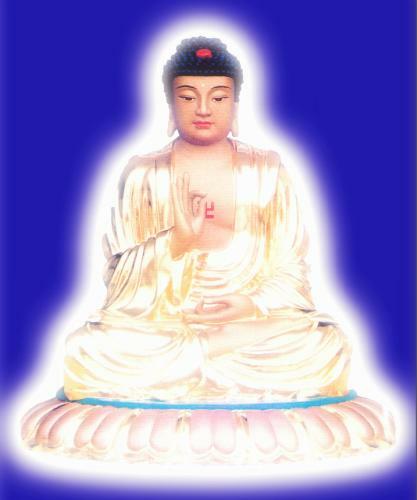 They had realized the Buddha’s liberation, which was profound, extensive, and great. They could, through expedient means, enter a single ground. Yet, supported by the ocean of all vows, they were constantly endowed with wisdom and would continue to be, to the end of time. They had completely fathomed the rare, vast, esoteric state of the Buddhas. They well knew the equality of all Buddhadharmas. They had already walked upon the Thus Come Ones’ ground of universal light. They had entered the door to the ocean of measureless samadhis. In all places they manifested appropriate bodies. Complying with the ways of the world, they cooperated with and adapted themselves to those around them. They were able to unite and uphold limitless dharmas on a vast scale, amassing an ocean of dharmas. They turned the irreversible wheel with eloquence and skill-in-means. They physically embodied the great ocean of meritorious virtues of all the Thus Come Ones. In accordance with their vows, they went to all lands where Buddhas were present. Throughout limitlessly many preceding eons they had made offerings to all Buddhas with tireless delight. They always dwelled in the bodhimandas of the Thus Come Ones, drawing near to them and never renouncing them. By means of the attainment of Universal Worthy’s ocean of vows, they constantly enabled all sentient beings to perfect the wisdom body. The Bodhisattvas had accomplished such measureless, meritorious virtues as these. Moreover, there were Vajra-wielding Spirits as numerous as motes of dust in Buddhaworlds. Specifically, they were: Vajra-wielding Spirit Wondrous Narayana Physique; Vajra-wielding Spirit Banner as Swift as the Sun. Vajra-wielding Spirit Flower Light of Mount Sumeru; Vajra-wielding Spirit Pure Thundercloud; Vajra-wielding Spirit Splendid Faculties; Vajra-wielding Spirit Delightful Brightness; Vajra-wielding Spirit Great Tree Thunderclap; Vajra-wielding Spirit Brilliant Lion King; Vajra-wielding Spirit Covert Blazing Spectacular Eyes; and Vajra-wielding Spirit Radiant Lotus Jeweled Topknot. These and others acted as leaders, and they were as many as motes of dust in Buddhaworlds. They all had constantly made great vows throughout limitless eons in the past, vowing that they would always draw near to and make offerings to all Buddhas. They had practiced according to their vows and had already fulfilled them, arriving at the other shore. They had amassed boundless, pure blessings through their deeds and had thoroughly fathomed the states of practice of all samadhis. They had attained spiritual powers and dwelt together with the Thus Come Ones. They had entered a state of inconceivable liberation. Amidst the assembly, their awesome light was especially penetrating. They manifested appropriate bodies to tame all sentient beings. They appeared in all places that have been conjured up by the Buddhas, diligently guarding and protecting the dwellings of the Thus Come Ones. Moreover, there were Multi-bodied Spirits as numerous as motes of dust in Buddhaworlds. Specifically, they were: Multi-bodied Spirit Cowl Adorned with Pure Flowers; Multi-bodied Spirit Light Illumining the ten directions; Multi-bodied Spirit Taming and Subduing with an Ocean-like Sound; Multi-bodied Spirit Cowl Adorned with Pure Flowers; Multi-bodied Spirit Limitless Aspects of Awesome Comportment; Multi-bodied Spirit Supreme Light Adornment; Multi-bodied Spirit Pure Light and Clouds of Fragrance; Multi-bodied Spirit Protecting and Gathering In; Multi-bodied Spirit Universally Manifesting to Gather In; and Multi-bodied Spirit Unmoving Radiance. These and others acted as leaders, and they were as numerous as motes of dust in Buddhaworlds. In the past, they all had fulfilled great vows to make offerings to and attend upon each and every Buddha. Moreover, there were Spirits of Foot Travel as numerous as motes of dust in Buddhaworlds. Specifically, they were: Spirit of Foot Travel Jeweled Seal Hand; Spirit of Foot Travel Lotus Light; Spirit of Foot Travel Pure Floral Cowl; Spirit of Foot Travel Good Looks Gathering in All; Spirit of Foot Travel Star Banner of Wondrous Jewels; Spirit of Foot Travel Gladly Emitting Wondrous Sounds; Spirit of Foot Travel Radiant Candana Tree; Spirit of Foot Travel Lotus Brilliance; Spirit of Foot Travel Subtle Radiance; and Spirit of Foot Travel Amassing Wonderful Flowers. These and others acted as leaders, and they were as numerous as motes of dust in Buddhaworlds. All of them had drawn near to the Thus Come Ones and faithfully followed them during limitless eons in the past. Moreover, there were Bodhimanda Spirits as numerous as motes of dust in Buddhaworlds. Specifically, they were: Bodhimanda Spirit Banner of Pure Adornment; Bodhimanda Spirit Sumeru Jeweled Brilliance; Bodhimanda Spirit Thunderclap and Banner-like Characteristics; Bodhimanda Spirit Raining Down Flowers Wondrous Eyes; Bodhimanda Spirit Flower Garlands Bright Cowl; Bodhimanda Spirit Raining Down Jeweled Ornaments; Bodhimanda Spirit Heroic Fragrance and Vision; Bodhimanda Spirit Vajra-Colored Cloud; Bodhimanda Spirit Lotus Flower Brilliance; and Bodhimanda Spirit Dazzling Wondrous Light. These and others acted as leaders, and they were as numerous as motes of dust in Buddhaworlds. In the past, they all had met limitlessly many Buddhas and had fulfilled their vows to make vast offerings to them. Moreover, there were City-ruling Spirits as numerous as motes of dust in all Buddhaworlds. Specifically, they were: City-ruling Spirit Jeweled Peak Illumination; City-ruling Spirit Wondrously Adorning Palaces; City-ruling Spirit Pure Jewels of Joy; City-ruling Spirit Pure and Free from Worry; City-ruling Spirit Flower Lamps and Blazing Eyes; City-ruling Spirit Clear Manifestation of Blazing Banners; City-ruling Spirit Flourishing Blessings Brightness; City-ruling Spirit Pure Radiance; City-ruling Spirit Fragrant Cowl Adornment; and City-ruling Spirit Wondrous Jeweled Light. These and others acted as leaders, and they were as numerous as motes of dust in all Buddhaworlds. They all had adorned and purified the palaces in which the Thus Come Ones dwelt throughout limitlessly and inconceivably many eons. Moreover, there were Earth-ruling Spirits as numerous as motes of dust in all Buddhaworlds. Specifically, they were: Earth-ruling Spirit Pure Flower of Universal Virtue; Earth-ruling Spirit Solid Blessings and Adornment; Earth-ruling Spirit Wondrous Flowers Ornamenting Trees; Earth-ruling Spirit Universally Scattering the Myriad Gems; Earth-ruling Spirit Pure Eyes Contemplating Time; Earth-ruling Spirit Wondrous Forms and Supreme Eyes; Earth-ruling Spirit Fragrant Shining Hairs; Earth-ruling Spirit Delightful Sounds; Earth-ruling Spirit Topknot of Exquisite Flowers; and Earth-ruling Spirit Body Adorned with Vajra. These and others acted as leaders, and they were as numerous as motes of dust in all Buddhaworlds. They had all made deep, impressive vows to always draw near all Buddhas in order to cultivate blessings through their deeds. Moreover, there were countless Mountain-ruling Spirits. Specifically, they were: Mountain-ruling Spirit Blooming Jeweled Peak; Mountain-ruling Spirit Flower Grove Wondrous Topknot; Mountain-ruling Spirit Lofty Banner Universally Shining; Mountain-ruling Spirit Immaculate Pure Topknot; Mountain-ruling Spirit Light Shining through the Ten Directions; Mountain-ruling Spirit Light of Great Strength; Mountain-ruling Spirit Universally Supreme, Awesome Brilliance; Mountain-ruling Spirit Orb of Subtle, Concentrated Light; Mountain-ruling Spirit Universal Eye Seeing the Manifest; and Mountain-ruling Spirit Secret Vajra Eyes. These and others acted as leaders of a countless number of Mountain-ruling Spirits, and they all had obtained the pure eye regarding all dharmas. Moreover, there was an inconceivable number of Forest-ruling Spirits. Specifically, they were: Forest-ruling Spirit Spreading Flowers Like Clouds; Forest-ruling Spirit Helping Trunks Grow Tall and Pouring Forth Light; Forest-ruling Spirit Producing Sprouts and Emitting Radiance; Forest-ruling Spirit Auspicious Pure Leaves; Forest-ruling Spirit Overhanging Resplendent Treasury; Forest-ruling Spirit Pure Radiance; Forest-ruling Spirit Delightful Thunder Sound; Forest-ruling Spirit Pervasive Glow and Perfume; Forest-ruling Spirit Wondrous Light Unique and Sparkling; and Forest-ruling Spirit Luster and Flavor of Flowers and Fruits. These and others acted as leaders of an inconceivable number of Forest-ruling Spirits, and they all had limitless, delightful, bright light. Moreover, there were countless Medicine-ruling Spirits. Specifically, they were: Medicine-ruling Spirit Auspicious; Medicine-ruling Spirit Candana Forest; Medicine-ruling Spirit Pristine Radiance; Medicine-ruling Spirit Universal Renown; Medicine-ruling Spirit Shining Pores; Medicine-ruling Spirit Pervasive Healing and Purifying; Medicine-ruling Spirit Roaring Loudly; Medicine-ruling Spirit Banner of Light Eclipsing the Sun; Medicine-ruling Spirit Clear Vision of the Ten Directions; and Medicine-ruling Spirit Replenishing Energy and Brightening the Eyes. These and others acted as leaders of a countless number of Medicine-ruling Spirits, and their natures were free from defilement. They graced all creatures with kindness. Moreover, there were countless Crop-ruling Spirits. Specifically, they were: Crop-ruling Spirit Tender and Delectable; Crop-ruling Spirit Pure Light of Seasonal Blooms; Crop-ruling Spirit Robust Strength; Crop-ruling Spirit Increasing Essence and Energy; Crop-ruling Spirit Universally Producing Roots and Fruits; Crop-ruling Spirit Wondrously Adorned Circular Cowl; Crop-ruling Spirit Moistening Pure Flowers; Crop-ruling Spirit Accomplishing Wonderful Fragrance; Crop-ruling Spirit Delighting the Beholder; and Crop-ruling Spirit Immaculate Pure Light. These and others acted as leaders of a countless number of Crop-ruling Spirits, and they all had realized great happiness. Moreover, there were countless River-ruling Spirits. Specifically, they were: River-ruling Spirit Universally Initiating Swift Currents; River-ruling Spirit Universally Cleansing Springs and Torrents; River-ruling Spirit Pure Eyes Apart from Dust; River-ruling Spirit Howling All Throughout the Ten Directions; River-ruling Spirit Rescuing and Protecting Sentient Beings; River-ruling Spirit Clear Light Devoid of Heat; River-ruling Spirit Universally Inspiring Joy; River-ruling Spirit Supreme Banner of Vast Virtue; River-ruling Spirit Light Illuminating All Worlds; and River-ruling Spirit Radiant Ocean of Virtues. These and others acted as leaders of a countless number of River-ruling Spirits, and they all diligently resolved to benefit sentient beings. Moreover, there were countless Ocean-ruling Spirits. Specifically, they were: Ocean-ruling Spirit Manifesting Jeweled Lights; Ocean-ruling Spirit Accomplished Vajra Banner; Ocean-ruling Spirit Far Removed from Defilement; Ocean-ruling Spirit Palaces in All Waters; Ocean-ruling Spirit Auspicious Jeweled Moon; Ocean-ruling Spirit Wondrous Floral Dragon Cowl; Ocean-ruling Spirit Universally Maintaining Flavor and Light; Ocean-ruling Spirit Jeweled Blaze of Floral Light; Ocean-ruling Spirit Wondrous Vajra Cowl; and Ocean-ruling Spirit Thunderous Sound of Ocean Tides. These and others acted as leaders of a countless number of Ocean-ruling Spirits, and the Thus Come Ones’ ocean of merit and virtue filled all their bodies. Moreover, there were countless Water-ruling Spirits. Specifically, they were: Water-ruling Spirit Creating Banners of Clouds Everywhere; Water-ruling Spirit Sea-Tide Cloud Sound; Water-ruling Spirit Wheel-like Cowl of Wondrous Colors; Water-ruling Spirit Whirlpools of Skilled Expedients; Water-ruling Spirit Immaculate Accumulation of Fragrance; Water-ruling Spirit Bridge to Blessings and Voice of Light; Water-ruling Spirit Comfortable Contentment; Water-ruling Spirit Kindly Sound of Pure Joy; Water-ruling Spirit Universally Manifesting Majestic Light; and Water-ruling Spirit Roaring Sound Pervading Seas. These and others acted as leaders of a countless number of Water-ruling Spirits, and they benefited all sentient beings, diligently saving and protecting them. Moreover, there were innumerable Fire-ruling Spirits. Specifically, they were: Fire-ruling Spirit Treasury of Universal Flames; Fire-ruling Spirit Banner of Universally Assembled Light; Fire-ruling Spirit Great Light Everywhere Shining; Fire-ruling Spirit Palaces of Multitudes of Wonders; Fire-ruling Spirit Cowl of Infinite Light; Fire-ruling Spirit All Kinds of Blazing Eyes; Fire-ruling Spirit Palaces Resembling Mount Sumeru in the Ten Directions; Fire-ruling Spirit Awesome Light of Self-Mastery; Fire-ruling Spirit Darkness-Destroying Brilliance; and Fire-ruling Spirit Thunder Sound and Lightning Flash. These and others acted as leaders of an inestimable number of Fire-ruling Spirits, and they all revealed various kinds of brilliance, dispelling the burning afflictions of sentient beings. Moreover, there were countless Wind-ruling Spirits. Specifically, they were: Wind-ruling Spirit Unobstructed Radiance; Wind-ruling Spirit Universally Manifesting Courageous Karma; Wind-ruling Spirit Drifting and Striking Cloud Banner; Wind-ruling Spirit Adornment with Pure Light; Wind-ruling Spirit Power to Dry Up Water; Wind-ruling Spirit Loud and Pervasive Howling; Wind-ruling Spirit Cowl of Trailing Branches; Wind-ruling Spirit Unimpeded Travel; Wind-ruling Spirit Manifold Palaces; and Wind-ruling Spirit Great Light Universally Shining. These and others acted as leaders of a countless number of Wind-ruling Spirits, and they all were diligent in eradicating thoughts of conceit. Moreover, there were countless Space-ruling Spirits. Specifically, they were: Space-ruling Spirit Pure Light Shining Everywhere; Space-ruling Spirit Universally Roaming Far and Wide; Space-ruling Spirit Producing Auspicious Wind; Space-ruling Spirit Dwelling Secure and Unhindered; Space-ruling Spirit Broad Stride and Wondrous Cowl; Space-ruling Spirit Unobstructed Blaze of Light; Space-ruling Spirit Unhindered Supreme Power; Space-ruling Spirit Immaculate Radiance; Space-ruling Spirit Far-Reaching Wondrous Sounds; and Space-ruling Spirit Light Pervading the Ten Directions. These and others acted as leaders of a countless number of Space-ruling Spirits, and their minds were free from defilement, being vast, bright, and cleansed. Moreover, there were countless Direction-ruling Spirits. Specifically, they were: Direction-ruling Spirit Pervasively Dwelling Everywhere; Direction-ruling Spirit Universally Displaying Brilliance; Direction-ruling Spirit Adorned with Luminous Practices; Direction-ruling Spirit Traveling Freely Everywhere; Direction-ruling Spirit Forever Severing Delusions; Direction-ruling Spirit Pervasively Roaming in the Pure Void; Direction-ruling Spirit Cloud-like Banner of Resonant Sound; Direction-ruling Spirit Unscattered Eyes of the Cowl; Direction-ruling Spirit Universally Observing the Karma of Worlds; and Direction-ruling Spirit Everywhere Touring. These and others acted as leaders of a countless number of Direction-ruling Spirits, and they used expedients to universally radiate bright light, shining eternally upon the ten directions. Moreover, there were countless Night-ruling Spirits. Specifically, they were: Night-ruling Spirit Pure Light of Universal Virtue; Night-ruling Spirit Happy Eyes Observing the World; Night-ruling Spirit Protecting the World’s Essence and Energy; Night-ruling Spirit Sound of the Tranquil Sea; Night-ruling Spirit Universally Manifesting Good Auspices; Night-ruling Spirit Universally Blossoming Flowers of Trees; Night-ruling Spirit Impartially Protecting and Nurturing; Night-ruling Spirit Joy of Playful Roaming; Night-ruling Spirit Perpetually Blissful Faculties; and Night-ruling Spirit Displaying Pure Blessings. These and others acted as leaders of a countless number of Night-ruling Spirits, and they all cultivated diligently and took delight in the Dharma. Moreover, there were countless Day-ruling Spirits. Specifically, they were: Day-ruling Spirit Making Palaces Appear; Day-ruling Spirit Exuding Fragrance of Wisdom; Day-ruling Spirit Adornment with Supreme Bliss; Day-ruling Spirit Fragrant Flowers’ Wondrous Light; Day-ruling Spirit Everywhere Collecting Wonderful Medicines; Day-ruling Spirit Happy Eyes Creating Joy; Day-ruling Spirit Universally Manifesting in All Directions; Day-ruling Spirit Great Compassion Light; Day-ruling Spirit Shining Light From Good Roots; and Day-ruling Spirit Lovely Flower Garlands. These and others acted as leaders of a countless number of Day-ruling Spirits, and they all brought forth faith and understanding of the wonderful Dharma. Together they constantly and vigorously adorned the palace. Moreover, there were countless Asura Kings. Specifically, they were: Asura King Rahu; Asura King Vemacitra; Asura King Clever Illusions; Asura King Great Retinue; Asura King Mighty Strength; Asura King Pervasive Illumination; Asura King Solid Practice and Wondrous Adornment; Asura King Vast Wisdom Regarding Causes; Asura King Displaying Supreme Virtue; and Asura King Splendid Sound. These and others acted as leaders of a countless number of asuras, and they all had diligently obliterated egoism as well as all other afflictions. Moreover, there was an inconceivable number of Garuda Kings. Specifically, they were: Garuda King Swift and Powerful; Garuda King Indestructible Jeweled Crest; Garuda King Pure Swiftness; Garuda King Steadfast Resolve; Garuda King Great Ocean’s Power to Gather and Sustain; Garuda King Unwavering Pure Light; Garuda King Skillfully Adorned Crown Cowl; Garuda King Adroitly Appearing Everywhere; Garuda King Universally Contemplating the Oceans; and Garuda King Universal Voice and Immense Eyes. These and others acted as leaders of an inconceivable number of garudas, and they all accomplished the power of great expedients, and were universally able to rescue and gather in all sentient beings. Moreover, there were countless Kinnara Kings. Specifically, they were: Kinnara King Bright Heaven of Kind Wisdom; Kinnara King Wonderful Floral Banner; Kinnara King Assorted Adornments; Kinnara King Delightful Roar; Kinnara King Brilliance of Bejeweled Trees; Kinnara King Delighting the Beholder; Kinnara King Adornment with Supreme Light; Kinnara King Exquisite Flower Banner; Kinnara King Earth-Shaking Power; and Kinnara King Gathering in and Subduing Evil Multitudes. These and others acted as leaders of a countless number of kinnaras, and they all diligently and vigorously contemplated all dharmas. Their minds were always happy, playful and free. Moreover, there were countless Mahoraga Kings. Specifically, they were: Mahoraga King Kind Wisdom; Mahoraga King Clear, Majestic Voice; Mahoraga King Supreme Wisdom and Ornamented Topknot; Mahoraga King Lord Wondrous Eyes; Mahoraga King Lamp-Like Banner That the Multitudes Rely Upon; Mahoraga King Supreme Light Banner; Mahoraga King Lion Chest; Mahoraga King Sound of Many Wondrous Adornments; Mahoraga King Solid as Sumeru; and Mahoraga King Adorable Brightness. These and others acted as leaders of a countless number of mahoragas, and they all diligently cultivated vast, great expedients, causing sentient beings to rend forever the net of delusion. Moreover, there were countless Yaksha Kings. Specifically, they were: Yaksha King Vaishravana; Yaksha King Effortless Sound; Yaksha King Sternly Holding Weapons and Insignia; Yaksha King Great Wisdom; Yaksha King Lord Flaming Eyes; Yaksha King Vajra Eyes; Yaksha King Robust Arms; Yaksha King Bravely Opposing Great Armies; Yaksha King Abundant Resources and Wealth; and Yaksha King Power to Topple High Mountains. These and others acted as leaders of a countless number of yakshas, and they all diligently guarded and protected all sentient beings. Moreover, there were countless great Dragon Kings. Specifically, they were: Dragon King Virupaksha; Dragon King Sagara; Dragon King Wondrous Banner of Cloud-like Sounds; Dragon King Mouth Aflame Lighting Up the Ocean; Dragon King Universal Banners of High Clouds. Dragon King Taksaka; Dragon King Boundless Stride; Dragon King Pure Color; Dragon King Booming Sound Carrying Everywhere; and Dragon King Free From Burning Afflictions. These and others acted as leaders of a countless number of dragons, and none of them failed to diligently form clouds and shower rain to douse all sentient beings’ burning afflictions.